Worship in church is a treasure. It is quite an experience living, serving, and worshiping with others who love God. Lifting His praises high with our voices and instruments and just coming together and using our gifts and abilities to serve Him is such a blessing. But sometimes church hurts. I have been a victim of church more than once. I grew up in an Independent Baptist church and was well-educated on how to have a performance-based relationship with God and with others. The hurt that comes with living and serving with other imperfect humans can be devastating and even detrimental to our walk with the Lord. Even now, years later, I still struggle to really allow myself to get fully attached or jump all the way in when it comes to being involved in a church. God reminds me so often that the relationship that matters most is the one I have with Him-one of grace and mercy and forgiveness and lots and lots of chances. Whether I am involved in a church or not, that never changes. But all throughout Scripture there are examples of believers and followers of Christ coming together to worship and to serve. So even though it is not a “requirement” to be involved in corporate worship or attend church every week, there is so much to glean from doing so and even more importantly, we each individual and unique gifts to offer to the body of Christ. God has called us to love as He has loved us. Loving people with the kind of love that we are called to as brothers and sisters in Christ requires giving and a huge amount of vulnerability without the promise of any return on our investment. The thought of loving someone who just might not love me back or who may mistreat me is terrifying. I often get completely swallowed up in fear of getting involved in a church or with other believers and then I start to notice more and more how messed up people in the church are. And then I focus more on that than anything else and before I know it, I don’t even want to go to church. Again, church is not a requirement but I can’t imagine for a second that we will be segregated when we are all in heaven some day, the people who annoy us or that we think are doing church or life or their relationship with God all wrong are not going to be somewhere else in heaven. We will be united and we will join together in worship of our magnificent Savior. You might even be right beside them – who knows! Yes, there are messed up people in church. Maybe they don’t do everything just the right way and yes, it might hurt to get involved in church but God LOVES relationship. He created us for relationship with Him and He yearns for His people to be together and loves it when we glorify Him in our unity. 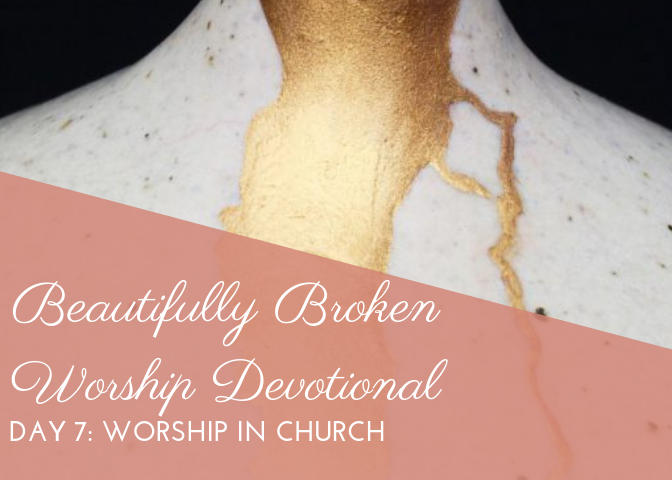 Remember that we are all broken, others are broken in a different way than we are, and sometimes it is more comfortable to stay away, but God has not called us to isolation and avoidance of others who are broken – He has called us to be united in Him. Even if just for an hour to an hour and a half a week we could set aside our fears and our judgments of others to come together and celebrate and worship the One who loves us all just the same, maybe we could get just a glimpse of what it will be like when we are all united with Jesus one day. This week we have allowed the Lord into several areas of brokenness in our lives. We have chosen to worship Him in our suffering. If we continue to invite Jesus into every place of our lives as we have this week, we will yearn to be around others who do this too. My prayer for each of us is that this will become our way of life. That we will learn to open our hears and invite Jesus into every part of our lives and that we will do the same with His people. Unity is powerful and it does not exist without each of us individually offering our hearts to the Lord and to each other. Ask God to show you what step towards unity with brothers and sisters in Christ He would like for you take. Go to church, join a small group, get involved in a community of believers! God has called you to it and He will be with you all the way through it! As you listen to the song today, close your eyes and imagine you are in the presence of Jesus Christ and with people who have hurt you or people you just plain don’t like. It is tough to focus on anything but Jesus when we are in His presence. Reminder: Listen with no distraction to the music video. Remember that in Christ, you can walk in confidence through anything because of Him!